HASSAN ABBAS: During your recent visit to Pakistan, you won the hearts of many through your courageous outreach - visiting Badshahi mosque, participating in television talk shows, interacting with students at country’s premier educational institution Government College Lahore, and most importantly going to the mausoleum of Mohammad Iqbal, the poet-philosopher who gave the idea of Pakistan. Even those who are critical of the U.S. policy were appreciative of these gestures and it served an important message to those Pakistani politicians also who are not in touch with masses. What were the signs of hope that you gauged during this visit? SECRETARY CLINTON: Well, first, the resilience and the courage of the Pakistani people. Everywhere I went, I met people who are speaking out and standing up and working hard, and that was extremely moving to me. I also felt like both the civilian government and the military leadership understood that the threat they faced had to be addressed. And I thought that was very promising, because the terrorist threat to Pakistan is growing and it’s intense and it can only be defeated by the Pakistani people coming together and rejecting it, in the first instance, trying to present a different narrative than the one that the terrorists are putting forth, using military force where they must, but mostly by developing the democratic institutions, by developing the country, clearly demonstrating that Pakistan has no room for those who want to tear down, because the Pakistan people want to build. HASSAN ABBAS: During the said trip you also visited Police offices in Islamabad to pay tribute to the sacrifices rendered by police officials in the fight against extremism. You are the first and so far the only foreign leader visiting Pakistan who thought of this. It is becoming clear in Pakistan that the country will not be able to win this battle especially in areas like Punjab and Karachi unless its law enforcement and police forces are reformed and upgraded. I must confess that this topic is of special interest to me as before my academic career in the US, I was a police official in Pakistan. Also Pakistan army cannot be expected to fight everywhere in the country. In this context, will the US be supporting police and law enforcement reform agenda in Pakistan? SECRETARY CLINTON: Well, we would be honored to do so, because I agree with you that the police truly are on the front lines. They often have to deal with the rush of violence that comes in cities or towns and they don’t have the support they need, they don’t often have the equipment that they need. And as you say, I met a number of police officers, both in Lahore and in Islamabad, who are very committed, but under-resourced. And I am more than happy to consider any request from the Pakistani Government to help the police force, because I agree completely that they’re the front line of defense. HASSAN ABBAS: Thank you very much. I am sure this would make a headline in Pakistan. I have been in touch with many of my former colleagues in the country and during my research on the subject, I found that Pakistan police is one of the very few organizations in the country where there is an internal institutional effort for reform. I hope your message of support in this sphere will be welcomed and appreciated in Pakistan. My next question is about U.S. relations with the Muslim world. This U.S. administration has certainly set a new tone of dialogue, reconciliation and respect in this realm. President Obama’s speeches in Turkey and Cairo were absolutely great and gave the right message to the Muslim audiences around the world. What is the follow-up on that? What are the next stages of that relationship? SECRETARY CLINTON: Well, it’s a great question because we’ve been working very hard on follow-up, and I recently attended a conference in Marrakesh, Morocco where we announced a number of follow-up actions. The one that was just embraced wholeheartedly was the idea of science envoys. I said at the time that much of the science that we take for granted today was really discovered and refined in prior times by Islamic scholars and scientists. And from astronomy to algebra, there’s so much that we owe to the Muslim world, and there needs now to be a renewed emphasis on science, which is not incompatible with religion, and therefore, we’re going to be sending Nobel science prize winners, former heads of the National Academy of Sciences, and so many others to visit universities and governments to try to rekindle that with our help. We’re also investing in more English language education programs. We’re investing in more business programs, entrepreneurship programs. We’re going to start a series of interfaith dialogues. There will be a lot of follow-up to Cairo because we have had such demand and we’re going to try to meet it. HASSAN ABBAS: You are known for your cordial relationship with Pakistani diaspora in the U.S. There is a large Muslim diaspora in the U.S. which I believe can act as a bridge between the U.S. and the Muslim world. Which are the other Muslim diaspora groups in the U.S. that you feel encouraged about and which can play a positive role? SECRETARY CLINTON: That’s a great question. Well, I do believe that the Palestinian diaspora has been galvanized around economic development. A number of my Palestinian American friends are making investments in the West Bank because the security has improved so much, thanks to the good work of President Abbas and Prime Minister Fayyad. So there is a rather dramatic increase in the economic activity in the West Bank which many American Palestinians are investing in. There are a number of Indian Muslims who are very involved in interfaith and other outreach activities. I do a lot of work with the Bangladeshi community, which is not as involved as the Pakistani community has been in academia or in professional activity, but is really at the grassroots in a lot of countries – or a lot of cities in our country. So I think those are some examples of what we’re working on. HASSAN ABBAS: My last question is about India-Pakistan relations. The United States has said many times that it would like to facilitate better India-Pakistan relations and I think there’s no doubt about the sincerity of that purpose. But of course, U.S. has its limitations in terms of how much it can do to bring both parties on the table and perhaps India is not very comfortable with the idea of third party mediation because of its stature, and reasons of history. However, President Obama made an interesting statement on the subject during his recent visit to China. European Union also is interested in playing a role in this arena. Do you think there might be some possibility in future that EU, China, and United States altogether can take an initiative to bring Pakistan and India together and help them resolve their differences. We continuously hear that peace in the Af-Pak region is considered the most critical issue for the global security concerns. A global approach hence can be relevant. Do you think such an international effort can work? SECRETARY CLINTON: I think it could be a guarantor or it could be a positive force for implementation. But I think that the impetus must come from the two countries themselves. And at some point, both countries might say we’ve gotten as far as we can get; therefore we need some support, we need some new energy. But we have to start with the two countries and with their commitment to pursuing this dialogue first. COMMENTARY: I was pleasantly surprised when out of the blue I received a message from the State Department inviting me to interview Secretary Clinton for my blog. I was also provided the opportunity to sit in during the interviews she gave to Riz Khan of Aljazeera and a Pakistani news channel. Riz Khan’s unending series of jokes were hilarious that kept us in good spirits while we all waited for the Secretary in a small and cozy room at the State Department. His fun performance was as spectacular as it was dramatic. However, I only came to know the next day that he was testing his jokes on us – as I heard him repeat all those jokes in his role as the master of ceremony in the inaugural event of the American Pakistan Foundation (APF) in New York. Secretary Clinton was the chief guest at the event and she made a splendid speech warming the hearts of a largely Pakistani-American audience. 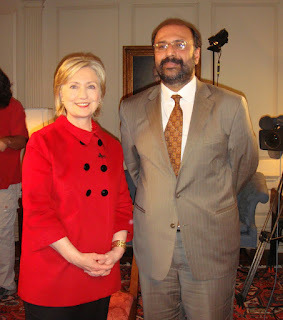 Hilary Clinton’s passion for Pakistan was palpable during the conversations I witnessed. She also referred to a special feeling that President Obama has for Pakistan and earnestly hoped that the U.S. – Pakistan relations would benefit from this supporting factor. She admired the way “Pakistan has pulled together to go after those elements of the Taliban that are directly threatening them.” What she left unsaid in this regard also says a lot about how U.S. is viewing the situation in Pakistan-Afghanistan border region. Her views about U.S. role in Afghanistan and globally were also insightful. There is a growing perception that U.S. is giving up the state-building goal in Afghanistan while focusing entirely on military ‘surge’. She dispelled this impression effectively when in response to a question from Riz Khan she argued that, “military effort is essential to providing security, but long-term stability, peace and prosperity can only come through political reconciliation, through development, through the enhancement of the capacity of Afghan institutions, expanding the education system – the kind of nuts and bolts that really build and sustain society” and emphasized that she is working hard for these objective. The people of Afghanistan deserve this and U.S. owe it to them but the fact remains that U.S. cannot manage this alone. She acknowledged this limitation while responding to a different question: “there’s not a problem in the world that the United States can solve alone, but I would quickly add there is not a problem in the world that can be solved without the United States.” While the second part of this notion is a debatable proposition, it is also surprising why U.S. has not involved regional players to stabilize Afghanistan. India, Iran, Turkey, Tajikistan, Uzbekistan and China besides Pakistan, all have stakes in Afghanistan and without a regional settlement U.S. will find it very difficult to turn the tables on growing insurgency in Afghanistan. Accommodating legitimate interests of Afghanistan’s neighbors will help. Hillary Clinton’s heartfelt concern for women rights in the Muslim world and highlighting a dire need for interfaith dialogue and harmony impressed me greatly. President Obama is lucky to have her on his side at a time when U.S. is aspiring to rebuild its image globally and looking for partners to ‘give peace a chance’. Her vision and guidance will surely prove to be a valuable asset for this administration. Hassan Abbas is a Bernard Schwartz fellow at the Asia Society in New York and a senior advisor at the Belfer Centre, Harvard Kennedy School. The interview was conducted on December 10, 2009 in Washington DC. The text of questions is slightly edited for clarity. For the State Department transcript click here. I am curious if brother abass and his cohorts have forgotten about the atrocities that the current regime and administration in the U.S. has been a part of all throughout the world?